Joy Junsay served as City Clerk for City of Marina for 21 years,and she is now the Executive Director of the Monterey County Peace Officers Association. Joy bought one of the original fundraising bricks in the patio in front of the Marina Library. “I was born in Okinawa on an army base, and I came to the Peninsula by way of the Philippines in 1957 with my parents and four siblings. During my early years, I watched my parents and brothers work in the strawberry fields between Crescent Avenue and Del Monte Boulevard here in Marina and bunch green onions in Salinas. My brothers worked with my parents in the fields to earn enough money to keep the family fed, clothed, and housed. Reading books occurred only in school for my brothers. The Bible was the only book read to us each evening. With only a sixth grade education, my father joined the U.S. Army and, after 22 years in the military, he retired in 1959 and took a job as a dishwasher at Neil D’Vaughn’s Restaurant on Cannery Row. My father enrolled in Hartnell College, where he earned an Associate of Arts degree with the help of the GI Bill. He became a mechanic (20+ years) for the Fort Ord Army Base Post Laundry. He was the neighborhood barber (military cut only), mechanic and handyman. My father was not one to read much except for the newspaper or automotive books. I enjoyed reading the automotive repair books he brought home and do it yourself books to learn how to do some of my own car repairs. My mother had only an 8th grade education. She was a farm laborer, a seamstress of automobile seat covers for NAFI (National Automobile Fabric Inc), Brad Whitney Company in Pacific Grove, and she worked at Colliers of Monterey sewing men’s suits. She was a mother of six, played the piano for our church and sang in the church choir, and she was a good cook. 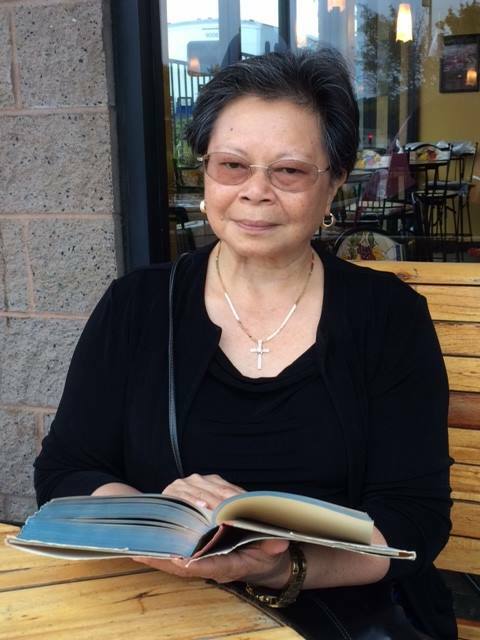 My mother built her reading skills through her daily Bible readings or books from church. We spoke English and Tagalog in our house growing up. My parents were too busy working and raising us kids to study English formally. Instead they learned the language through daily contacts with their American counterparts at work. They encouraged us kids to read so we would do well in the future. They did everything they could to build a foundation for their children through hard work, perseverance, persistence, and helping others. I remember when Marina’s library was a tiny building on Carmel Avenue, about the size of a one bedroom home, later relocated to a storefront in the Seacrest Shopping Plaza. I’m so pleased that the people in Marina pulled together to build the larger library we all enjoy now. It is a real community center.